To see a GOP presidential candidate cozying up with Nazis and white supremacists shouldn’t come as a surprise , given the fact that the party’s ethnic outreach organization  little more than an extension of the Third Reich . The Reagan GOP was staffed by personnel selected by Helene von Damm, a protege of Otto von Bolschwing , Eichmann’s superior in administering the Third Reich’s extermination of the Jews. 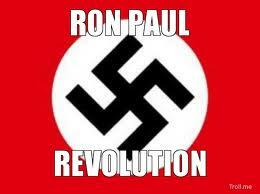 Is Ron Paul an operative of the Underground Reich? Is that why he maintains the kinds of connections that he fosters? Is that why he wrote the things in his newsletters that he did? Is “1% er” Mitt Romney an operative of the Underground Reich? Is Peter Ackerman, another “1% er” and one of the driving forces behind the “Muslim Brotherhood Spring” of 2011 Underground Reich? Is that the reason behind his launching of Americans Elect? Note in this context that Grover Norquist and Karl Rove launched the Islamic Free Market Institute, a parallel network to the GOP/Nazi ethnic outreach milieu. Will Paul’s young potheads be allowed to inhale some weed, just before they inhale some Zyklon B? Not the maverick he portrays himself as being, Paul is openly allied with GOP frontrunner Mitt Romney, and could serve Romney in a number of ways. Recently, Paul garnered enthusiastic support during a tour of college campuses, touting his opposition to the Iraq War, desire to eliminate the Federal Reserve and support for states rights, among other things. Claiming he might not support his ally Romney if he got the nomination, Paul has floated the idea of running as an independent. Should he do that, it is possible that he might pull in some of the morons–young morons in particular–who’ve been hoodwinked by his Third Position views. Fulfilling the role of a right-wing Ralph Nader, he could be decisive–for Romney. Ron Paul’s success with young and ignorant voters. Using his opposition to wars in Iraq and Afghanistan, desire to cut off U.S. foreign aid to Israel (which resonates with the Berkeley/Pacifica Radio constituency), support for “states rights” marijuana initiatives and adherence to the 9/11 Truther ideology, Paul has successfully played the role of pied piper to the young and innocent. His recent success at U.C. Berkeley follows on the heels of a standing ovation given to Louis Farrakhan  by an audience at the same institution. The pivotal role of ultra right-winger Peter Thiel  in the Ron Paul fund-raising effort. Thiel has donated most of the money that has gone into the Utah-based Ron Paul super PAC. In FTR #718 , we looked at Thiel’s links to the Underground Reich milieu. The overt political alliance between Paul and Romney, something that should surprise no one. We also undertake review of some interesting connections between the Underground Reich and the Mormon Church. A German national who has become one of the most important officials in the Mormon faith has overt links to the vertriebene milieu . Jerry Uchtdorf’s family are Sudeten Germans, expelled from Czechoslovakia and later East Germany, experiences that apparently informed much of Uchtdorf’s current political perspective . The LDS has given a considerable amount of money to Islamic Relief Worldwide, a Muslim Brotherhood front organization founded by a relative of Hassan al-Banna himself. (Al-Banna is the founder of the fascist Muslim Brotherhood.) Islamic Relief’s U.S. representative is Kazbek Soobzokov, son of SS officer and former U.S. intelligence agent Tscherim Soobzokov. Islamic Relief has manifested overt Nazi sympathies and symbolism, as well as supporting Hamas and [allegedly] Chechen terrorists. Support for Ron Paul given by Americans Elect, an organization founded by Peter Ackerman, former right-hand man to Junk Bond King Michael Milken, financial angel to nonviolent theoretician Gene Sharp and one of the forces behind the “Muslim Brotherhood Spring” of 2011. Americans Elect could lend impetus to a Ron Paul Third Party candidacy which, in turn, might siphon enough anti-war, anti-Israel, “Truther,” pro-weed votes away from Obama to do for Romney what Ralph Nader did for George W. Bush in 2000. Romney’s alliance with Israeli Prime Minister Benjamin Netanyahu, himself an heir to the fascist element within the Zionist movement. EXCERPT: GOP presidential candidate Ron Paul, on a three-day campaign swing in California that has attracted overflow crowds, said Thursday his withdrawal from the race is “not going to happen” – and he isn’t certain he’ll support Mitt Romney should the former Massachusetts governor win the party’s nomination. . . . In a reference to the raid this week on Oaksterdam University and marijuana dispensary in Oakland, he said, “If you have states’ rights in California, you wouldn’t have the feds bugging you and telling you what you could do with your own body.” . . . COMMENT: It should surprise no one that Romney and Paul are strategic political allies. EXCERPT: . . . Despite deep differences on a range of issues, Romney and Paul became friends in 2008, the last time both ran for president. So did their wives, Ann Romney and Carol Paul. The former Massachusetts governor compliments the Texas congressman during debates, praising Paul’s religious faith during the last one, in Jacksonville, Fla. Immediately afterward, as is often the case, the Pauls and the Romneys gravitated toward one another to say hello. Jabotinsky, writing in the Italian Zionist paper, indicated that the alliance was one of ideology, not of convenience and expediency. Benjamin Netanyahu’s father Benzion Netanyahu, was the personal secretary for Jabotinsky. The elder Netanyahu was also a pallbearer at Jabotinsky’s funeral. Menachem Begin had been a member of the Betar. Another Israeli Prime Minister–Yitzhak Shamir–belonged to the Stern Gang. The Israeli right-wing has continued its interface with European Nazis and fascists. The Romney/Netanyahu axis, in addition to presenting a distorting element to Obama’s middle east policy, could conceivably manifest as some sort of October Surprise gambit vis a vis Iran. . . . . That shared experience decades ago led to a warm friendship, little known to outsiders, that is now rich with political intrigue. Mr. Netanyahu, the prime minister of Israel, is making the case for military action against Iran as Mr. Romney, the likely Republican presidential nominee, is attacking the Obama administration for not supporting Mr. Netanyahu more robustly. Only a few weeks ago, on Super Tuesday, Mr. Netanyahu delivered a personal briefing by telephone to Mr. Romney about the situation in Iran. . . .